Last year I made an animated timeline of the Middle Ages, from my book Science: a Discovery in Comics. Now I’ve gone a bit further and animated the entire History of the Earth! I’m pretty proud of this. I used Sparkol Videoscribe to make it, a program that’s perfect for my kind of bring-your-comics-to-life animation. The duration is just under five and a half minutes, which is an eternity on the internet – but I calculated that if I had done the timeline of the earth on the same scale as I did the Middle Ages (a thousand years in three and a half minutes), this animation would have been 30 years. My Dutch book ‘Wetenschappen in Beeld’ gets a second print run! It has only been in stores for a few weeks, so I’m very happy! Especially for the english-speaking followers of my blog, I have translated a few pages of the book to showcase here. In time, it will probably be published in English with the title ‘Science: a Discovery in Comics’. 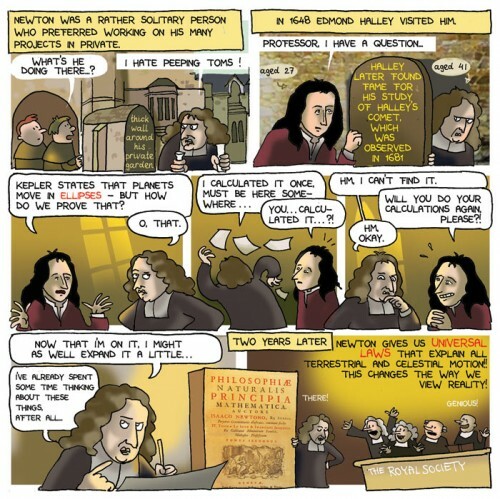 Here’s a page from the chapter about Isaac Newton. It seems he was a rather grumpy man, which made it great fun to make a comic about him.